Inspired To Educate - How can a free massively collaborative game potentially help save lives? Home crowdsourcing How can a free massively collaborative game potentially help save lives? As a game developer, I have become convinced that games can have a profound impact in teaching and changing the world. Why? Games encourage us to take on epic challenges and objectives. In the act of making a game, designers and developers have the opportunity to craft the rules of the game to encourage collaboration and teach complex problems. The world has lots of big problems to solve. A well crafted game encourages the community of players to take up grand quests because the game is challenging and fun. I believe that games that involve human collaboration can be especially potent since the player does not feel alone in their quest. Finally, games give us feedback on our progress on the quest. In some games like Angry Birds, I can celebrate when I get “three stars” on a level. I can enjoy the epic cheers from my fans as I rock the house in games like Rock Band. Feedback may appear in the form of a score, badges, celebrations, cheers or coaching from fellow players. These aspects of games help keep us stay engaged in learning and solving complex problems. I have been greatly influenced by my reading of Dr. Jane Mcgonigal, writer of “Reality is Broken: Why Games Make Us Better and How They Can Change the World.” I really enjoyed the chapters devoted to using the power of community to explore and solve real world problems. 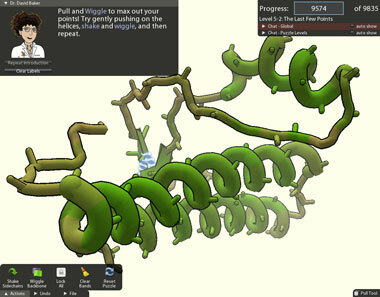 FoldIt is a powerful example of the community empowered to perform research about protein folding. And it’s fun too! The act of collaborating with a massive number of online players is very engaging. 5 reasons why FoldIt is awesome! It teaches a complex subject in a simple way. It allows hands on interaction with the subject of protein folding. It connects “text book” theory of protein folding to research in the real world. The game shows the power of massively collaborative online games. The game supports research for curing HIV/AIDS, Cancer, and Alzheimer’s. So… if you were to ask the community to solve an epic world problem, what would you challenge them to do? How can a game designer help you?